1. High precision deep hole drilling machine, EDM machine, wire-cutting machine, vowin.cn/en/News/news1251.html' target='_blank'>milling, grinding, auto punching machine, carving machine, 800tons to 1000tons high precision vowin.cn/' target='_blank'>plastic injection molding machine etc advanced equipments. 2. 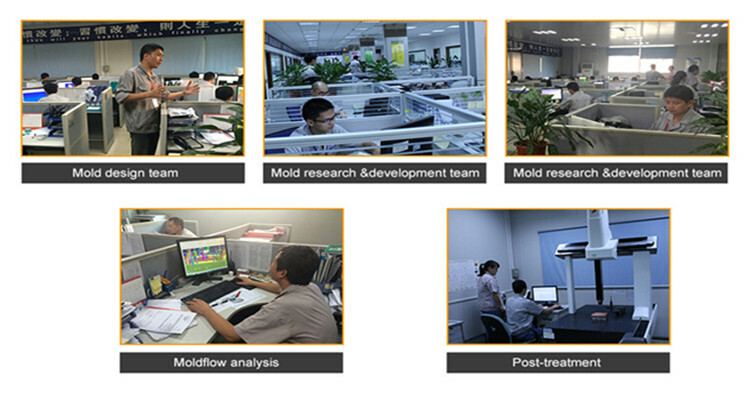 20 Professional engineers 15 Pro-ID & MD 15 Pro-Moldflow analysis 40 skilled technicians 10 QC technicians. 3. Tooling workshop. From design control, steel hardness inspection, electrode inspection, core and cavity steel dimension inspection, pre-mould installtion inspection, trial report and sample inspection,export package inspection and ISO certification etc mould quality control process, Strictly QC process to control the quantity of the mold manufacture & final mould qualification. Post-treatment workshop. Advanced equipment is to carry out the component finishing post-treatment processing. 4. Assembly workshop. 10+ advanced assembly lines and experienced engineers &operators control every detail from packing to final loading and on-time delivery. 5. Plastic injection molding parts tested workshop.